I've seen these stats before. But it wasn’t until recently that I realized this doesn't begin in the labor and delivery room. Hell, it doesn’t even begin during the 1st trimester. Caring for women, caring for Black women, begins way before then. And we must go back to the "father of gynecology" to begin this story. It wouldn't be a reach. You see, from day one, Black women in this country were viewed as less than. While slavery and Jim Crow laws are supposedly a thing of the past, the deep biases that still exist are beyond harmful. When we look at it in the context of the medical field, it's quite literally a matter of life and death. I could recount Serena's story or share stories of close personal friends. Their experiences were sharp reminders of the dangers Black women face when delivering a child. Instead, I want to tell you about a couple of personal experiences, away from the labor and delivery floor that for me, are a powerful reminder that the medical care of Black women in this country is lacking to say the least. I want to tell you about how I walked into an exam room in the spring of 2017, after entering 17 days of pain due to my endometriosis. On that day, I was meeting with a surgeon, desperate for relief and in a state of alert waiting for the next round of painful days to begin. As a matter of form, I am meticulous with medical histories. Just the facts, ma'am. But I also have a light airiness about me. It's what helps me get through tough times. Facts and humor, friends. About 5 minutes after meeting the person that would be cutting into me, I was told this: "I can tell you have a high tolerance for pain." I honestly didn't process that until later since the discussion turned to surgery dates and what needed to be done to get me relief. When I left the office, in my car, I thought "damn, there it is again." Don’t get me started on that one time when I went into early labor at 30 weeks and the doctor had to do a cervical ultrasound to “double check” that the contractions hadn’t really gotten the party started with the under-baked Frog Princess. Now, we said yes to it because we felt we had to make sure. The ultrasound has to be done WITHOUT LUBRICATION. Ladies, I’ma let y’all think about that for a second. I got through it as the nurse COACHED THE DOCTOR – because, teaching hospital – and after we were told we could go home and had basically been discharged, he returned and stated that he wanted to do ANOTHER ONE for no good ghatdamb reason but because he wanted to practice. Do you know they had us sign papers to state that we were leaving against medical advice because we wouldn’t let him put me through that hell again? Y’ALL! I was appalled! Hadn’t they put me through enough? STAT: Black women with at least a college degree had higher SMM rates than women of any other races/ethnicities who never graduated high school. Doctors are already not looking out for women of color. They are already discounting pain, experience and need based on something other than what's in that chart. It’s no wonder that the rate for Black women is three times that of White women! The perfect illustration of this has been the recent death of Kim Porter at the age of 47. Kim who had been telling her doctor that something wasn't right and was experiencing pain. Kim who died unnecessarily. It breaks my heart. All of it. But, as always, it's up to us to ensure we are in an environment where our health and wellness is a priority and where our needs and concerns are not dismissed. By the way, the difference in care with my second surgeon is not lost upon me. A woman of color herself, there was an attentiveness and care there that I had not felt before. We are partners in my health. My voice matters, my concerns are taken seriously, she is checking for all the things known to her in order to ensure that I am safe and healthy. But so often, that is not the case. And so often, we see small warning signs with our providers. It's up to us to take the lead regarding our care. To ensure that we not only speak up when something doesn't feel right but that we have advocates that can stand behind us. 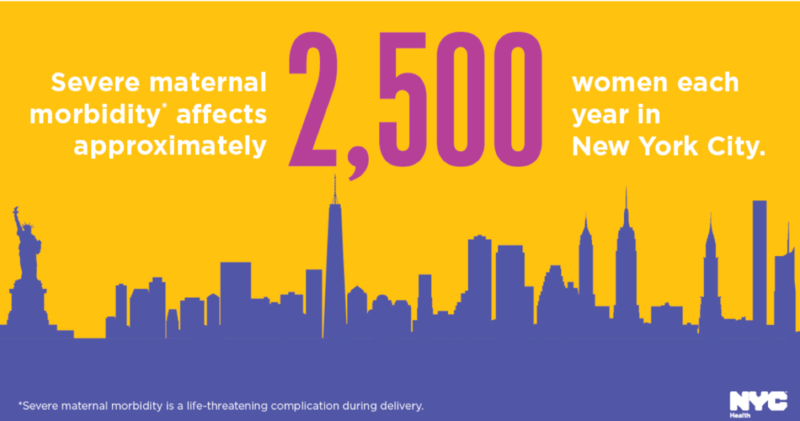 In New York City, severe maternal morbidity has increased 28% from 2008 to 2012. That’s unacceptable! Lastly, spread the word! So many of the people I talk to have no idea about these are the stats. We only have each other in this, let’s make sure we ensure the lives of moms and babies (especially Black and Brown ones) are cherished the way they should be). Disclosure: This post is supported by funding from Merck, through Merck for Mothers, the company’s 10-year, $500 million initiative to help create a world where no woman dies giving life. Merck for Mothers is known as MSD for Mothers outside the United States and Canada. Funding from Merck for Mothers supports The New York City Department of Health and Mental Hygiene and the Fund for Public Health in New York City’s efforts to reduce persistent racial and ethnic disparities in maternal health. The views and opinions expressed in this article are those of the author and do not necessarily reflect the position of any aforementioned entity or New York City agency.